The 15 breathtaking view locations of autumn leaves in Kyoto! Also, we tell you the best time to see and illuminate time. In autumn Kyoto, when we feel the little winter in the morning and evening air. The autumn leaves are at their best of see. Beautiful autumn leaves in the historical temples, fallen leaves in the mossy garden, the mountains are covered by autumn foliage, illuminated autumn colors in the dark night…..
Over the thousand nights, the magnificent scenery which is fascinating every Kyoto people. 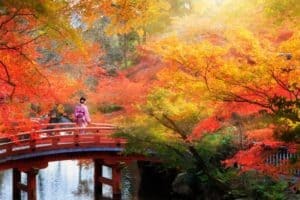 In this year, which spot do you want to visit in autumn Kyoto? From the ancient time, MiyakoBito(Ancient Kyoto citizen) usually say “We should visit Eikando for watching autumn leaves.” That scenery is one of the most popular in Kyoto. It is visited by many sightseers every year. There are colored 3,000 trees they make a picturesque scenery which is like a Japanese brocade. ※It means, deep inside the mountain, this autumn colored tree surrounded by outstanding rocks. It leaves will must be fallen without any opportunity to see the shining sun light. This waka is written in the Kokin-wakashu it is named “Iwagaki Momiji”. It displays the autumn tree in the back shrine of Eikando. Even though it is over 1000 years ago, still we can see the same situation. The official name of Eikando is Zenrin-ji temple. It is originally Shinjo(Kukai’s apprentice) was given the mountain villa by Fujiwara, and he use it as the Dojo of Shingon sect in 853. Jiho-ten (temple treasures show) is held in every November. At the same time, Eikando opens to the public. Fantastic illuminated autumn leaves view, it becomes unforgettable scene for you. ・Get off at Subway Tozai Line “Kegami” station, and about 15 minutes on foot from the station. ・Get off at Kyoto city bus “Nanzenji Eikon doodo” bus stop, and about 3 minutes on foot from the station. Nanzen-ji temple is the headquartersof the Nanzen-ji branch of the Rinzai Sect of Zen Buddhism. If you enter here, sublimity gates of Sanmon will catch your eyes. It is also called as 「Tenka Ryumon」(It means The whole world dragon gate. ) It is counted as a part of Japan’s three major gates. This is in the kabuki drama “Sanmon Gosan-no-Kiri,” Goemon Ishikawa’s famous word. When he watch the scenery from Sanmon of Nanzenji-temple, he said like this. Also, speaking of Nanzenji-temple, Lake Biwa Canal which was built to transport water Lake Biwa to Kyoto City is famous spot too. The arch of red bricks “Suirokaku Aquaduct” and autumn leaves, they made beautiful contrast. ・Get off at Subway Tozai Line “Kegami station” and about 10 minutes on foot from the station. and about 10 minutes from the bus stop. 3. Amazing view of Yama-Momiji (Mountain maples) which beyond the time of thousand years. Arashiyama, it was loved by ancient Kyoto people. This place is foremost Kyoto’s scenic spot. Togetsukyo Bridge is the best locate for enjoying beautiful Yama-Momiji. This bridge is historical. It begins in 834 to 848. The name of Togetsukyo is derived from Kameyama emperor’s Haiku. This bridge and Arashiyama make symbolic and fascinating view of Kyoto for a long time. station”and about 5 minutes on foot from the station. ・Get off at Kyoto city bus “Arashiyama Tenryuuji mae” and about 5 minutes from the bus stop. From Arashiyama to the end of bamboo grove, Gion temple quietly standing in front of a nallow alleys of the road of Oku Saga. It is known to famous temple for watching autumn leaves. The name of Gion temple is derived from Gio a dancing girl who won Taira no Kiyomori’s favor. She is exiled from Kyoto because of Kiyomori’s change of mind. After that, she was joined this temple with her mother and sister. Green mossy garden, red falling leaves… Repeating season shift and her tragic love episode, they are on my heart together with the end of fall. Station” and about 20 minutes on foot from the station. “Saga Shogakko (elementary school) mae” and about 17 minutes on foot from the bus stop. Houkyouin is a temple of Rinzai sect which os located in Arashiyama Sagano. The brilliant autumn leaves garden is broadcast and too much tourist visit here. This fascinating garden view, wherever you see, it takes your breath away. Especially the scene from the main temple, it is the best of view. 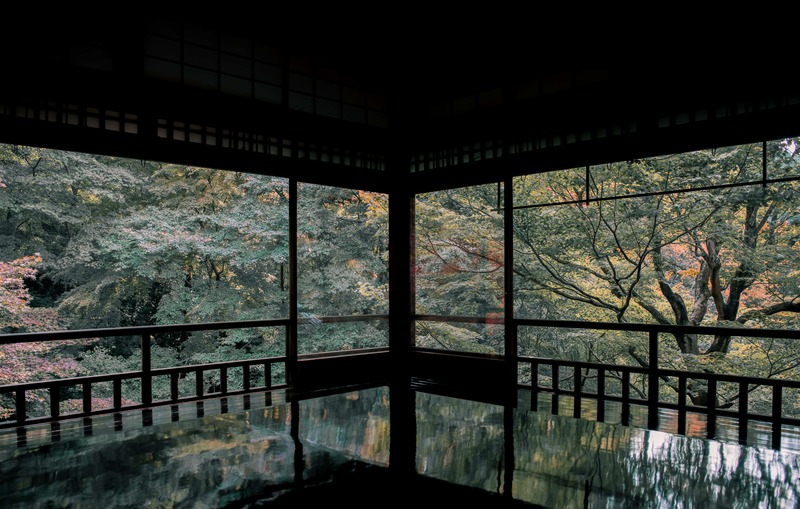 Firstly, you visit the Honzon (principal image of worship), and look back, you can watch the breathtaking autumn view which is framed by the shoji frame. ※Even though we can take a photo by phone’s camera or hand-held camera, we cannot full-fledged shooting such as while use a camera with tripod. and about 12 minutes on foot from the station. ・Get off at Kyoto city bus “Saga Syakado mae” and about 4 minutes from the bus stop. Jisso-in is a head priest of Temple of Jimon School of the Tendai sect which is one of construction of the Kamakura period. The honzon is Hudo-Myouou that is grant the people’s wishes widely. So, a lot of people visit here to pray and many temple treasures are left behind. The one of famous autumn leaves spot is storn garden of Karesansui (dry-garden style) which is borrowed landscape of Mt. Hiei. It commands a distant view of Mt. Hiei, peacefulness neat stone garden, and red maple trees, they create breathtaking view. Also, the another spot is Floor Momiji which is reflected on the floor in the Taki (water fall) room. Reflected autumn leaves on the black polished floor, this fantastic view becomes unforgettable memory for you. ※It is prohibited to take a Floor Momiji pikture. ・Get off at Hiei Electric Rail Arashiyama Line or JR Kurama Line　”Iwakura station” and about 16 minutes on foot from the station. ・Get off at Kyoto city bus “Iwakura Jisso-in” and nearby here. Sanzen-in is a one of the five Monzeki temples of Tendai sect, a lot of cultural assets including a national treasure Amida Sanzon statue are settled in here. It is too famous spot to us to watch autumn leaves, this scenery spreading on a large site and too much sightseer is fascinated. Even though there are a lot of famous spot, we recommend Yuusei-en garden. In the green mossy garden, there are a lot of Warabe Jizos which are created by Kosaku Sugimura, they are smiling to the visiters. The collaboration view of fallen leaves, moss and Jizos. We only can watch it in this place. ・Get off at Kyoto city bus “Ohara” and about 10 minutes on foot from the station. Daigo temple has a lot of scenery spot in the 2 million tsubo (Approximately 6.6 million ㎡）extensive precincts. The best of autumn leaves spot is 「Bentendo」of Shimo-Daigo which enshrines a one of the seven deities of good fortune Benzaiten. From the other side of the hall, you can watch vermilion Bentendo and the bridge, and trees dyed in color they are reflected on the pond and create gorgeous autumn view. ・Get off at subway Touzai Line　”Daigo station” and about 15 minutes on foot from the station. ・Get off at Kyoto city bus “Daigoji” or “Daigoji Mae”and nearby here. Bisyamondo which enshrines a one of the seven deities of good fortune Bishamonten. Surrounded by trees, there is a quaint Ikezumi grand garden 「Banuien」. Not only it but also there are a lot of autumn leaves spot in this popular temple. Especially a long approach to Tyokushi Gate. In the deep autumn, the scattered leaves from the trees dyed the road like a red carpet. Keihan Dentetsu line “Keihan Yamashina station”and about 20 minutes on foot from the station. Umanokouji Park, 15 minutes on foot from Kyoto station. It is popular spot with wide lawn space, Kyoto aquarium and Kyoto railway museum. Not only sightseer but also local people gather this place. There is a Japanese garden 「Suzaku garden」in the park, this is a tourist spot for watching autumn leaves. There is a shallow called 「Mizu Kagami(Water mirror)」in the central Ikeizumi stroll garden. It reflects surround beautiful leaves. Illumination event 「Umenokouji park autumn leaves festival」is held in middle of November to early December. In the event, you can enjoy a different view from the daytime. ・Get off at every rail way “Kyoto station” and about 15 minutes from the station. There is no need any explanation spot 「Kiyomizu temple」. Even if you don’t live in Kyoto, didn’t you visit on a school trip? 4 million tourists visit this temple each year. If you visit here in the autumn season, it becomes more attractive spot. Even though you can enjoy autumn view everywhere in the precincts, especially we recommend Kinunkei gorge under the Kiyomizu stage. If you watch it, you can enjoy breathtaking view. Also, there is an another famous spot 「Sanjuuno To(Triple tower)」. This 60m vermilion tower and autumn leaves, they make us the atmosphere of Kyoto. This temple is illuminated in middle of November to early December. Especially in this season,there are a lot of tourists gather here. Just before and after the resuming gate in the evening, there is a long queue up to Sannen Zaka(three year slope) So, we recommend after a few hours from it or just before the closing gate time. Furthermore, in November usually gets crowded, if you want to avoid it, then you should visit during December. ※Kiyomizu temple is under construction until 2021. So, it possibly you cannot watch the temple like a picture. However we can enter here as usual. ・Get off at electric rail Keihan “Kyoto station” and about 25 minutes from the station. ・Get off at Kyoto city bus “Gojouzaka” and about 10 minutes from the station. Toufuku temple, it has the biggest and oldest Buddihist temple. It is the one of best historical temple. Also, there is a famous garden handed by garden artist Mirei Shigemori who is representing the Showa era. In the past, monk afraid cherry blossom viewers interrupt their training. So, they cut the all trees from the precincts. After that, they planted the maple trees as a replacement of it. 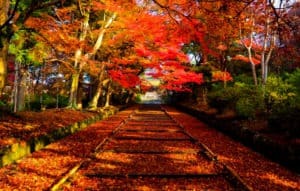 As a result, Tofuku temple was become a famous autumn leaves spot. The three bridges that cross the ravine Sengyokukan crossing the east and west in the premises. Those bridges are called Ganun Bridge, Tsuuten Bridge and Engetsu Bridge. Tourists usually take a photo of collaboration between each bridge and autumn leaves. So, a lot of photo enthusiasts visit here for it. 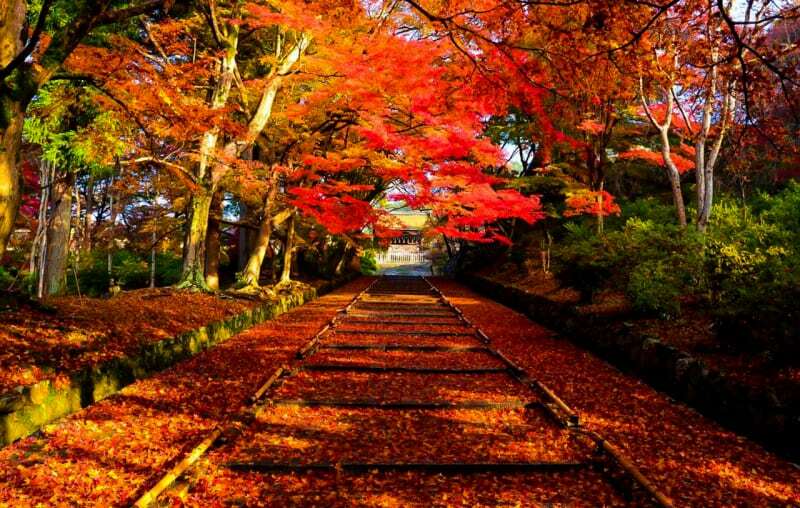 ▲It will be fun to watch the autumn leaves while walking through Tsuten Bridge. Autumn leaves of Tofuku temple that has been appointed as a TV commercial and tourist poster. If you have never watched this superb view, then you should visit here in the autumn. ・Get off at JR Nara line or electric rail Keihan “TofukuJI station” and about 10 minutes from the station. ・Get off at Kyoto city bus “Toufukuji” and about 5 minutes from the station. ▲Kibune shrine settled in the mountainous area Sakyo Kyoto city. It shows beautiful appearance every season, such as spring fresh green and illuminated event in the winter snow day. Many worshipers visit every year for watching photogenic shining shrine in the nature. ▲Kasuga lanterns with the approach which is frequently posted on TV and magazine. The approach to the shrine which representative place. In the autumn season, it and the autumn leaves show more beautiful scene. Also, all the inside of precincts, besides along the highway leading leading to Okumiya are lighted up, surrounding area is surrounded by gentle light. Why do not you visit enjoying the beauty of eternity that makes you almost forget about the time? Early November to late November. ・Get off at electric rail Eizan “Kifuneguchi station” and about 30 minutes from the station. ・Get off at Kyoto city bus “Kifune” and about 5 minutes from the station. 「Rurikoin」 is in the place which walked about 5 minutes on foot from Yaso Hieizanguchi station at the end of station of Eizan main line. It is a famous temple in a quiet mountain. On the about 12,000 tsubo (about 40 thousand ㎡), there is a famous garden with nature as a landscape, it gives pease of mind to the hearts of visitors. This Rurikoin previously it was only for people involved to enter. However, it is now open to public only twice in spring and autumn for protecting cultural properties and public interests. ▲The spectacle like a movie scene is in front of us! Such a “Kinshu” (Beautiful autumn view which is like brocade). If you visit here in the autumn public season, you can watch at the beautiful autumn garden. However, if you want to look around, you must purchase a limited ticket for that day. Start selling tickets every morning 9:00. If you get surely, we recommend you should go to the store before sales start time. ・Get off at electric rail “Yeze Hieizan station” or Hieizan cable “Yeze station” and about 5 minutes from the station. ・Get off at Kyoto city bus “Yeze Ekimae” and about 7 minutes from the station. 15. The Takao autumn leaves which fascinated the ancient Kyoto citizen for long times. Takao located in the middle of Takao Mountain which is settled in the northwest of Kyoto city. Tsuganoo located in the upper streanmof Kiyotaki River and Masanoo located in the middle of the river. They are called as Mio (Three “o”), and have been popular as a famous autumn leaves spots. Here is dotted with three red leaves sights, 「Shingo temple(Takao)」,「Saimyou temple(Makinoo)」,「Kosan temple(Tsuganoo)」 each of which is on a short walking distance. ▲Shigetsukyo bridge crossing over the Kiyotaki River. Attractive autumn view spreads before enter the precincts. 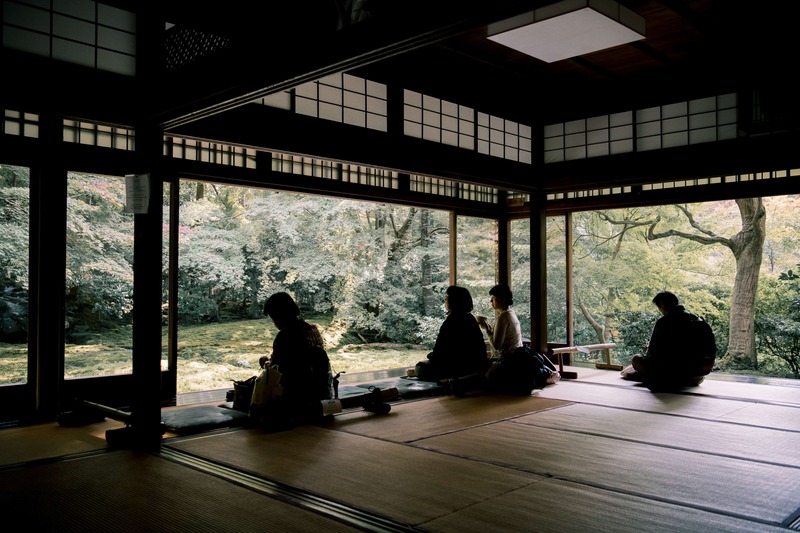 ▲ The famous Buddhism priests Kukai and Saicho, they stayed in Shingo temple. You should show the temple treasure as well. The recommended way to sightseeing, firstly, go to Kosan temple in the upper stream of Kiyotaki river by bus. From there to the Saimyou temple and Shingo temple while watching the valley. Each place has different sights, so, you can enjoy autumn leaves over half a day. Kyoto autumn quietly, we recommend it. How was it? Although we could not introduce, there are a lot of Red leaves spot in Kyoto. Such as 「the way of philosophy」 that can walk around in front of the gate of Ginkaku temple, 「Fushimi-Inari Taisha」 is popular for foreigner and 「Maruyama park」 for the relaxation place of Kyoto citizen. In this season, every spot of Kyoto is crowded. However, depends on a time such as early morning, you can look around the spots smoothly. Let’s plan well in advance such as time and place by a map or guide book. 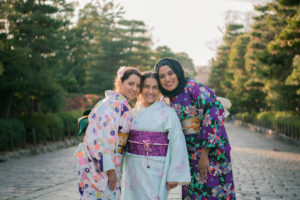 It is also good idea to organize a schedule together with the unique Kyoto culture and experience. And in the future if you wish to have more memories in Japan, please contact Your Travel Story Japan. We are providing photo service to more than 2000 travelers in each year. Photographers we have are very good with local places in Japan and they will take the best photos at best places. 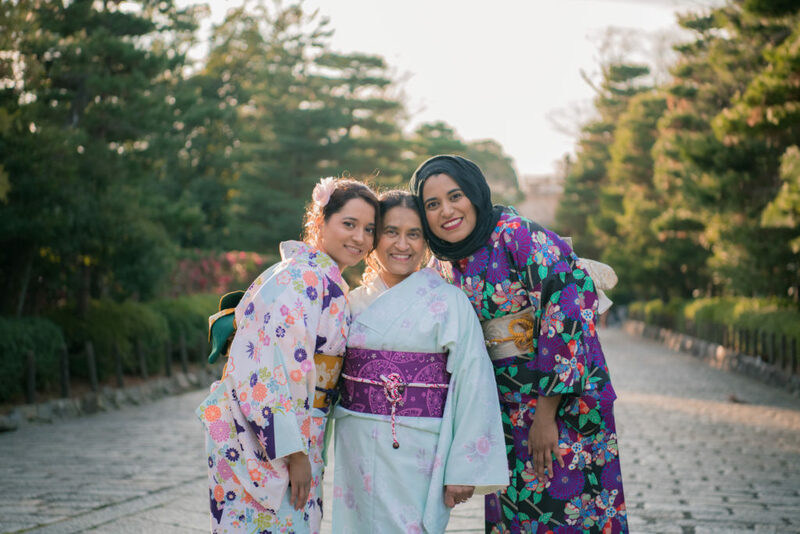 Isn’t it wonderful to get pictures of your trip to Japan with your loved ones? ※the pictures are before 2016. ※This article information is at the time of interview, and it does not ensure the accuracy of information. Regarding current information, please contact us directly. In addition, it is prohibited to use any picture or text in this article to another contents.